HOUSTON (July 26, 2018) The Houston Dynamo have requested an appeal of the red card issued to midfielder Tomás Martínez (shown left) for serious foul play in the 59th minute of Wednesday’s match against the Philadelphia Union (VIDEO). The Dynamo went down a man in their match against the Union after Martínez was sent off following a Video Review. After initially whistling for a goal kick after Martínez attempted to put a shot on target, the referee reviewed footage on the pitchside monitor and determined Martínez had committed serious foul play that endangered the safety of the opponent. The appeal has been supported by the Major League Soccer Players Association. An independent three-member panel comprised of one member of US Soccer, one member of the Canadian Soccer Association, and one independent representative nominated by the Professional Referee Organization will oversee the review of any player appeal. 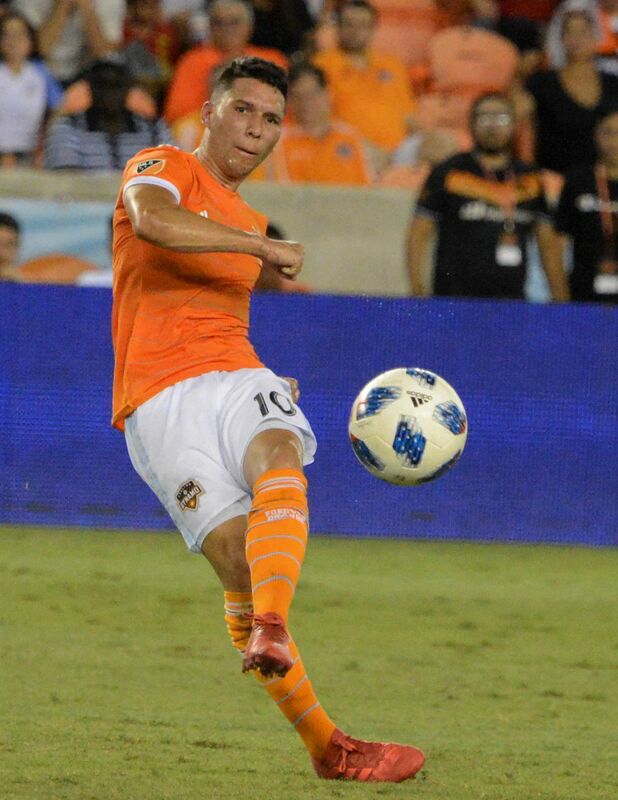 If the appeal is upheld, the red card punishment will be rescinded, the Houston Dynamo will retain their two appeals for the 2018 season, and Martínez will be eligible to Saturday’s match against the Portland Timbers at Providence Park at 10:00 p.m. CDT. If the appeal is rejected, Martínez will serve a one-match suspension on Saturday against the Timbers. HOUSTON, TEXAS (July 25, 2018) Beneath the full moon at BBVA Compass Stadium, the Houston Dynamo lost a hotly contested game against the Philadelphia Union, 3-1. 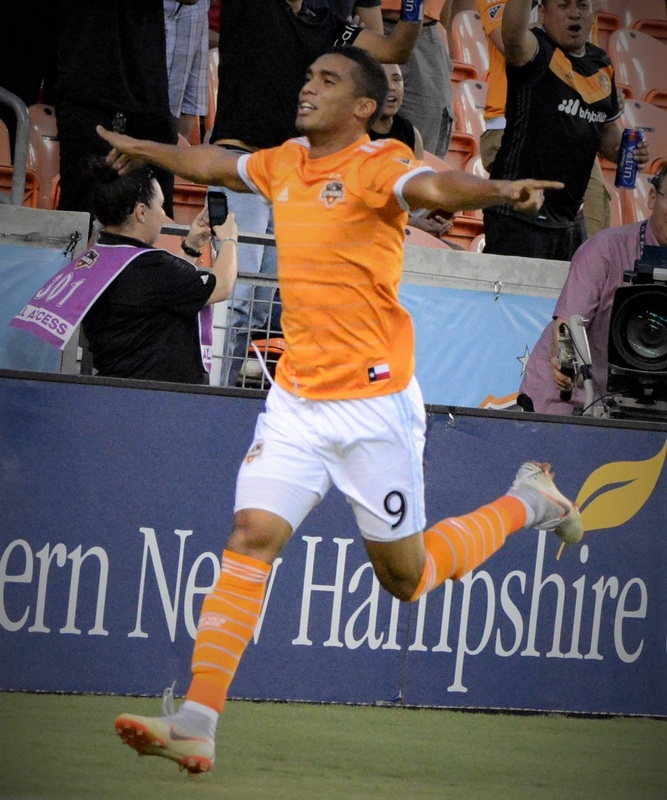 The first half of the game saw the Dynamo offense frustrate the Union’s defense and nine minutes into the game Mauro Manotas score his 10th goal in as many games. Most of the first half of play was focused on the Philadelphia goalbox with seven shots on goal to the Union’s one. In the 33rd minute a goal scored by Union player Alejandro Bedoya, went under review and ruled it as a good goal. After this goal, the Union started showing sparks of life in the offense with a few fantastic saves by the Dynamo goalkeeper, Joe Willis, kept the game 1-1 going into halftime. In the second half of the game, the Dynamo’s game started unraveling, leaving everyone in the stadium scratching their heads and wondering what they were seeing. A yellow card was issued to the Union’s Mark McKenzie in the 53rd minute. In a fantastic drive down the field in the 58th minute, Tomas Martinez (shown above right) set up for a goal when the on-field referee blew the whistle, halting play and issued Martinez a red card for “serious foul play”. The play was reviewed by the VAR, (Video Assistant Referee), and the issued red card stood. In watching the playback, Tomas stepped on a Union players foot. In the press conference following the game, Houston head coach Wilmer Cabrera stated, “none of us on the field knew what happened,....I haven’t seen anything like that in my life.” He went on to state that the game was, “out of control, out of control of discipline.” When Martinez questioned the red card, no one could give him an answer. 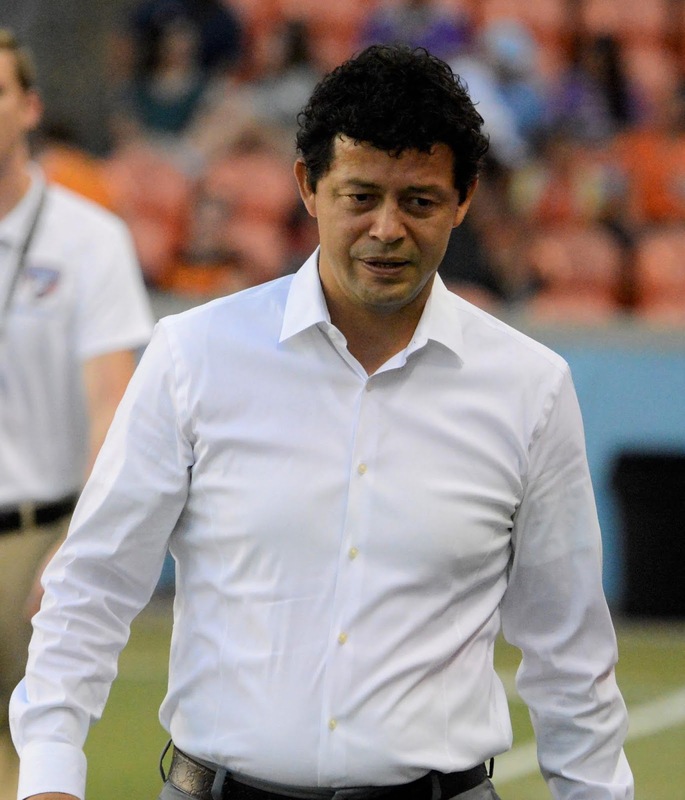 When Oscar Boniek Garcia, the Dynamo captain, questioned the referee, there was no answer. When Cabrera questioned the call to the fourth official on the sideline there was no answer. The fans also expressed their displeasure of the call loudly and only continued to get louder by letting the on-field referee know that they didn’t appreciate his officiating. An additional yellow card was issued to the Union’s number 17, C. J. Sapong. After the 60th minute the game was no longer controlled by the Dynamo. The Union scored in the 70th minute by on a goal by Cory Burke and in the 96th minute by Fabrice-Jean Picault. 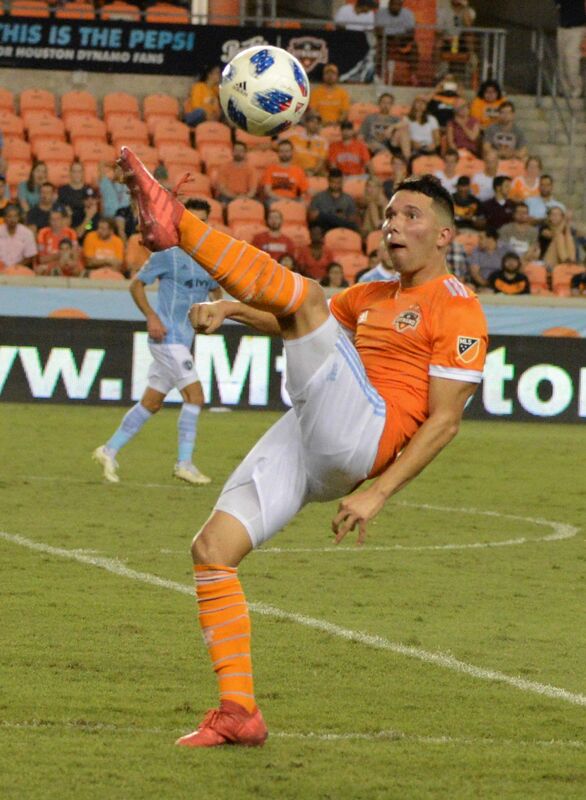 The goal by Picault was the result of the yellow card issued to the Dynamo’s, Alejandro Fuenmayor, which created a goal kick for Picault. The game ended in a 3-1 loss by the Dynamo. There was a grand total of five yellow cards and one red card issued between the twp teams during the course of the game. The Dynamo are back in action against the Portland Timbers in Portland on Saturday, June 28 with a 7:30 p.m. CST kickoff. HOUSTON, TEXAS (July 21, 2018) The Houston Dynamo and FC Dallas battled to a one-all draw in the first game of the annual Texas Derby at BBVA Compass Stadium. The draw pushed Houston's record to 7-6-6 (27 points) for the season, with Dallas posting a 11-3-6 (39 points) in 2018. It took Dallas less than a minute; actually about 45 seconds, to score. Right after the kickoff, Dallas took control of the ball, with the play ending up in front of the Houston net. Defender Matt Hedges took possession and "drilled" it past goalkeeper Joe Willis, who was named the Dynamo "Man of the Match." It was the first goal of the season for the 27-year-old team captain, who was selected by Dallas as their first pick of the 2012 MLS SuperDraft. Houston answered the Dallas goal in true orange and white fashion, in the eighth minute, when Mauro Manotos (shown left) headed the ball into the nest, for his tenth goal of the season. The assist was credited to Romell Quioto. It was the Honduran's 11th assist of 2018. The rest of the first half saw both squads aggressively attacking each other's defense; attempting to put an additional goal on the board. In an attempt to get an advantage, Dallas substituted, in the 25th minute, Tesio Akindele for Santiago Mosquera. It was the Canadian's eighth appearance in 2018 for Dallas, with seven of those appearances coming as a substitution. Dallas got close to taking the lead in the 36th minute, but was denied as a result of a vital tackle in the box by captain DeMarcus Beasley. The crowd got a bit aggressive early in the second half when Houston was cited for a infraction and Dallas was awarded a penalty kick in the 62nd minute. Midfielder Roland Lemah took the PK, which was immediately blocked by Willis. Houston got the ball on the counter attack and scored off an assist by Beasley and kick from inside the box by Mauro Manotas. A review of the goal was ordered and it was determined the Houston forward was off-sides; disallowing the goal. Houston head coach Wilmer Cabrera (shown right) talked about the game in his post-game press conference. The next game in the Texas Derby, which determines the possession of El Capitan, will be on August 23 at BBVA Compass Stadium. The rubber-game will occur on September 1 at Toyota Stadium. Tonight’s Houston Dash match at the Washington Spirit has been postponed to 9 a.m. CDT on Sunday morning due to poor field conditions as a result of heavy rain all day at the Maryland SoccerPlex. The match was originally scheduled to kick off at 6 p.m. CDT this evening. The referees, in consultation with the National Women’s Soccer League (NWSL) and the teams, made the decision that the field was deemed to be unplayable on Saturday evening. 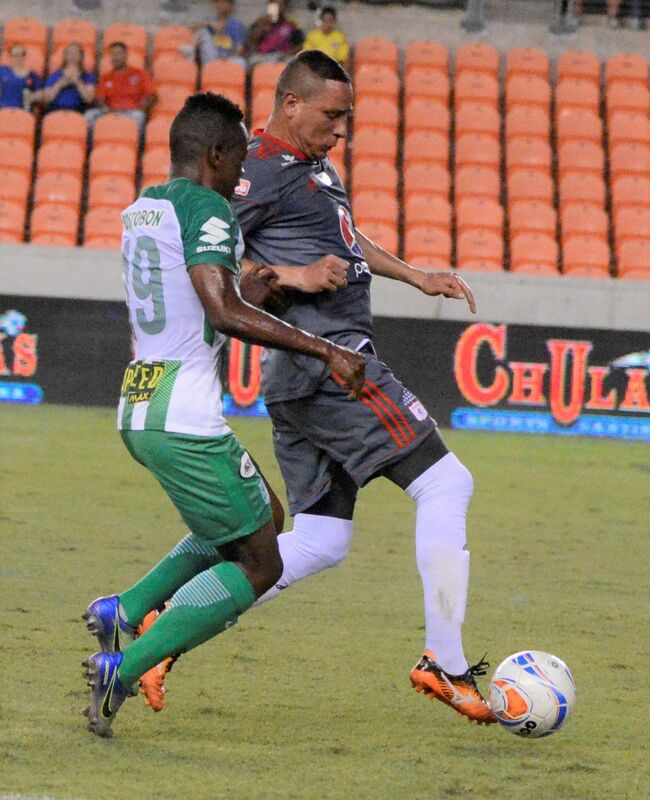 America de Cali downs Atletico Nacional by penalty kicks in pre-season friendly. The match saw spirited play, and the 7,000-plus spectators in attendance were not disappointed in both teams play. The first half was a give-and-take affair, which much back-and-forth action. The view of the fans in the seats was very involved for the Columbia soccer fans. Despite a lack of scoring in the first 45-plus minutes, both teams remained focus going into the locker room at half. In the second half, the ball finally found the back of the net when Cristian Dajone, who entered the game in the second half, knocked the ball past goalkeeper Cristian Vargas in the 56th minute for the first score of the game. America took a 1-0 lead. Nacional rebounded and tied the score in the 73rd minute with a right foot to left post penalty kick by Gustavo Torres. After the end of regulation, penalty kicks went into play, with Cali outscoring Natcional 5-4 for the win. 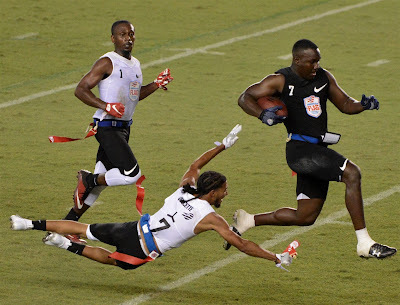 HOUSTON, TEXAS (July 19, 2018) The 2018 football season got an early start on Friday evening, when the American Flag Football League Ultimate Final came to Houston, with $1,000,000 on the line. Fighting Cancer, who blew through the America's Championship bracket with a 35-26 win over The Money Team on July 14, to face Godspeed, who won the Pro Championship by taking down Ocho 28-12, to advanced to the final. 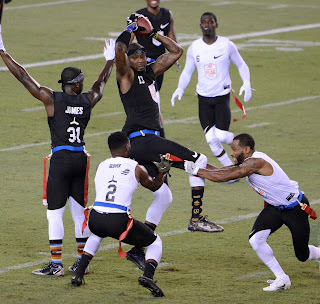 Fighting Cancer, who was made up of talented amateurs, former college and arena football players, faced off against Godspeed, who fielded a team of former NFL players and Olympians. The game, which kicked off at 7:30 p.m. CD at BBVA Compass Stadium, saw a great deal of action, but little scoring in the first 30 minutes of play. Fighting Cancer score a six-point touchdown and one-point conversion right before the half to take a 7-0 lead into the locker room. The second half saw increased scoring, as the amateurs tacked on 19 additional points to take the game, the league's Ultimate Title. Godspeed finally got on the scoreboard with a six-point touchdown with under three minutes in the game. The game ended with Fighting Cancer downing Godspeed 26-6. The stadium was a rainbow of jerseys; NFL, college, high school, and Pop Warner league. It did not matter where you look among the orange colored seats of BBVA Compass Stadium, Every fan was within two-to-three feet of another fan in some sort of football apparel. A compete season, with possible expansion, is planned for 2019. HOUSTON, TEXAS (July 15, 2018). 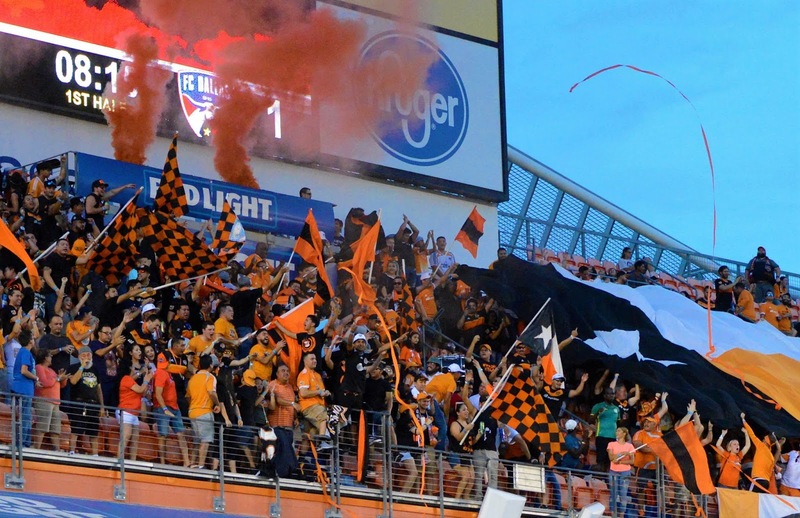 The week of July 15-21 will be a busy time at Houston's BBVA Compass Stadium. Four events will be held on four consecutive days, beginning on July 18. On Wednesday, the Houston Dynamo will host Sporting Kansas City in the quarterfinal round of the Lamar Hunt U.S. Open Cup. Kickoff is slated for 7:30 p.m. CDT. Kansas City is the defending U.S. Open champion, taking their fourth title last year (2017). Their previous titles were in 2002, 2012, and 2015. U.S. Open Cup is the oldest ongoing national soccer competition in the U.S.
On Thursday, July 19, the AFFL U.S. Open of Football Ultimate Final will be held. The final game will pit Godspeed against Fighting Cancer, with kickoff set for 7 p.m. CDT. The 7-on-7 tournament promises high-scoring offensive fireworks with non-stop action. 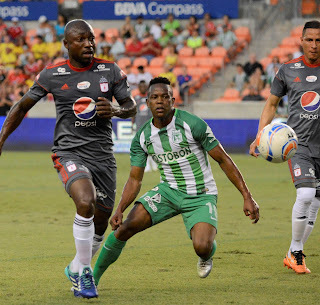 Friday, July 20 will see Atletico Nacional and America de Cali play a friendly soccer match in the grand opening event off the Colombian Fest in Houston, with kickoff at 8 p.m. CDT. The four days of events will conclude on Saturday July 21 with the Houston Dynamo hosting FC Dallas in the first of the three-game series of the Texas Derby, with an 8 p.m. CDT start. On the eighth Houston shot of the contest, Senderos tallied his third goal of the season. The score was the third of his career for the Geneva, Switzerland native. He added his second goal seven minutes into the second half to give the Geneva, Switzerland native his first career brace in Major League Soccer. 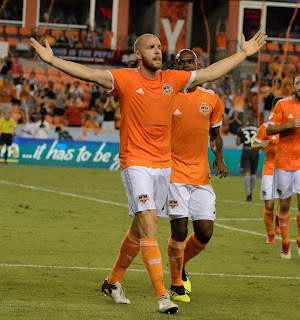 Sanderson became the second Dynamo defender to score two goals in a single game since Craig Waibel did so 13 years ago, on October 14, 2016, against Colorado. Alberth Elis (No. 17, shown right) scored his ninth goal of the season, when he connected in the second minute of second-half stoppage time. It was then forward’s 20th goal in all competitions for the Dynamo this season. He is the ninth player in Dynamo history to score 19 or more goals. In four previous matches against Minnesota, the Dynamo has come out on top once, a 2-1 win on September 20, 2017 at home. Their first two meetings ended in draws; a 2-2 decision on April 15, 2017 and a scoreless ending on July 19, 2017. The only loss for Houston came earlier this, on April 28, 2018, when Houston fell 2-1 at TCF Bank Stadium. The win extended the Dynamo’s home unbeaten streak to consecutive MLS matches, in addition to eight in a row across all competitive matches. It also improved their record to 7-6-4 on the season and their 2018 home record to 6-2-1.